The repartee at the Bill Nye/Randall Munroe New York Comic Con panel rocketed back and forth between the serious and the silly as Nye, star of the PBS show "Bill Nye the Science Guy," and Munroe, creator of the webcomic "xkcd," discussed creationism, scientific literacy -- and how to turn your apartment into a ball pit. Munroe and Nye made a good tag team, pivoting off each other's answers and keeping the audience laughing with a series of running gags. Munroe kicked it off with a question about style, not science: When did Nye start wearing his trademark bow tie? Back when Nye was a junior in high school, there was a tradition that the boys wait on the girls for their annual athletics banquet. "I said to my colleagues, 'If we're going to do this, let's dress like waiters,'" he said. "My father, who is very good with knots, showed me how to tie a bow tie, and you will find, gentlemen -- and the occasional lady -- that when you wear a bow tie, it will not slip into you soup. It will not flop into your flask." Now, he said, "It's just a thang." Getting a bit more serious, Munroe asked Nye how he balances the need for simplicity and precision in his work. "That is the dark art," Nye answered. "Show, don't tell. Did you ever experience this troubling thing where you are asked to define a word, and you use the word you are trying to define? The same is true whether you are doing a science demonstration on camera, or if you are writing about it: Make every effort not to use the official word for it until you describe it." He demonstrated by explaining a new concept right there on stage: "They have done these remarkable studies that show if you move toward someone and then have an interaction, you are more likely to like that person and get along with that person than if the geography of the floor plan or whatever makes you move away before you start interacting with that person," he said. "This is called 'embodied cognition.'... You could introduce the term 'embodied cognition' first, but then I think this is really distracting -- 'embodied what?'" Nye turned to Munroe and said, "Your whole thing Randall, is you take a charming question and then pursue it to absurdity with scientific rigor." "The reason I am writing these articles really, deep down, is that once I see the question, I get really curious about the answer," Munroe said. 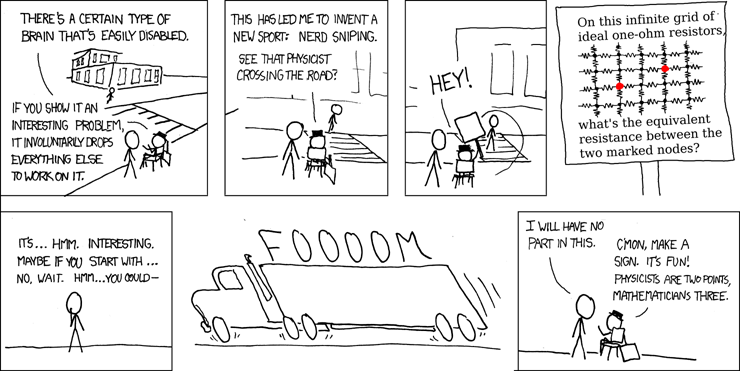 He actually did an "xkcd" comic about this, called "Nerd Sniping." "If you surprise someone with a question, if it's something that they have some tools that could conceivably help them answer, if you get a certain kind of person, it will derail everything else they were doing to try to work on that," he said. "If someone is crossing a road, you could hold up a sign with a math problem on it and they would stop and try to work on it -- and get hit by a car." "I would be that guy," said Nye. "If I see an equation by the side of the road, I'm just going to think" -- he slipped into a dramatic voice -- "'What sort of sick game are these people playing? They want me to be hit by a car!'" The conversation switched over to Nye's book, "Undeniable: Evolution and the Science of Creation," which was prompted by his debate with Ken Ham, the president of a creationist organization, Answers in Genesis. "They work very hard to indoctrinate school kids that the earth is 6,000 years old and everything we observe in nature is not true," Nye said. "This is troubling for me, as an engineer who grew up in the U.S. The only thing that keeps the United States in the game, economically, is the ability to innovate. If we raise a generation of young people in the heartland of the United States who don't believe in science, or the process of science, who do not possess what we like to call critical thinking skill, then you are just headed for trouble." "What's your favorite kind of question?" Nye asked Munroe. "I really like the questions that come from little kids," said Munroe. "You assume it's because little kids are inherently more creative than us or something, but I really don't think that's it. Maybe they are, but I think that really, it's because they are not trying to ask a question with an interesting answer, like they aren't trying to construct a situation that will, baked into it, have all these crazy consequences. They are just asking a really straightforward question, like, 'I want to build a building that's a billion stories tall. Will that work? Can I do that? What will happen?' And then that question turns out to have a lot of really interesting consequences." That led into a discussion of the specifics of building a billion-story building ("You have got me thinking about that specific question," said Nye. "Now, while I am reading it, I'm going to be hit by a car. "), such as the materials it would be made of and how to avoid bumping into the moon. While that may seem far-fetched, Munroe pointed out, there is a proposal to build a space elevator, although it is still far from becoming a reality. "One of the big problems is how do you build the elevator car that goes up it," said Munroe. "How do you power it? If you are going to have it carry fuel with it, it ends up being all fuel, so you have to power it from the ground somehow." Right now, there is a competition to solve that particular part of the problem. "It's like looking for your keys under the light -- well, this is the part we can solve right now, so let's do that," Munroe said. That led into a digression about the time a security guard found Munroe trying to break into his mailbox when he was in college. "It was my mailbox," Munroe said, "and the mail person was like, 'Why are you trying to pick the lock on your own mailbox?' and I said, 'My key is inside.' And then there was this really long pause as they tried to figure out if there was a plausible way that I could have gotten the key inside and then locked the mailbox behind it." Nye started speculating, but before anybody got hit by a car, Munroe supplied the answer: "I had forgotten my keys at home, and my mom had mailed them to me, and I had forgotten that on that key ring was the key I needed to open the mailbox." "I've gotta ask, because this is something that does not occur to someone who has not tried to fit a ball pit in their apartment: What contained them?" Munroe asked. "He actually used chicken wire and went around the room," the audience member said, adding that the pit was only two feet deep -- "We wanted to go to four, but it would cost $2,000." Then he turned to Nye and said, "Mr. Nye -- I have waited my whole life to say that -- I would like to let you know that you were a huge inspiration to me as a child, growing up in a Christian household. I am now at the age of 30 I have a degree in condensed matter physics, I run a nonprofit organization to teach science to kids [cheers and applause] fightforscience.org." His question: How can you talk about science in a way that doesn't devolve to faith versus science? Try to stick to the facts, Nye said, adding, "If you have family that has been brought up with this their whole life, it's not something that's going to change in a weekend." Later, as he was responding to another question, Munroe touched on that point, and on what was really bringing all the people in the room together. "Everyone likes to know how stuff works," he said. "I had some creationist friends growing up in the south, and what I found was if I argued with them they would go right back, 'Oh, you are challenging this -- I am going to quote the Bible,' but if I just talked about, 'Here is a really interesting thing I learned in geology or saw on this TV show by this guy in this tie,' then they get be excited too. People everywhere are excited to learn how things work. That's what I try to do is just try to share that excitement, and maybe people will see that and be like, 'Hey I want to learn more about what's got him so excited!'" Another questioner asked what could be done to fight scientific illiteracy. Nye's response was to watch his show: "That is my mission in life, to try to solve that problem," he said. Munroe's response was also to watch Nye's show. "I would say 'Read my book,'" he said, "but when it comes down to it, I grew up watching 'Bill Nye the Science Guy,' so reading my book is just a more indirect way to watch the show."